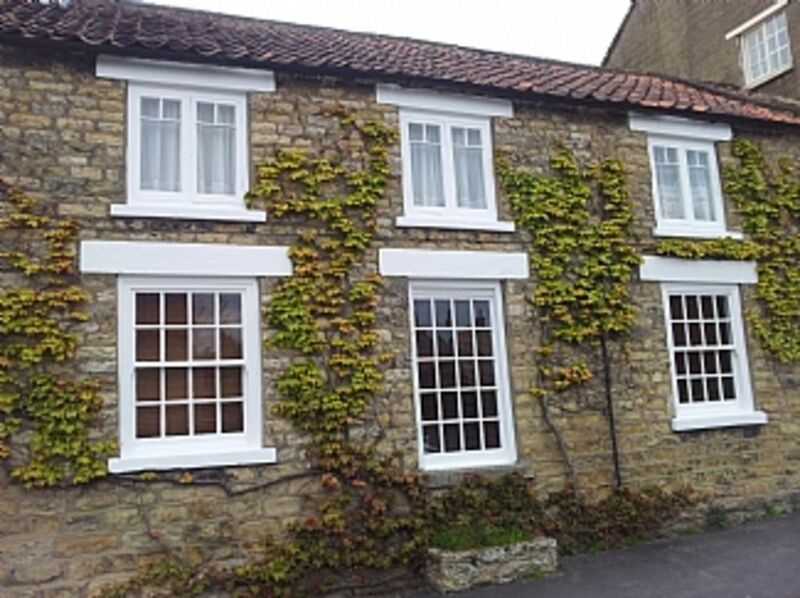 A luxurious spacious traditional stone built cottage situated in the centre of village close to all amenities. Entrance into vestibule sun room with French doors opening onto patio and garden. Large kitchen with range cooker plus utility room. Spacious lounge with open fire and beamed ceiling, separate dining room downstairs toilet washbasin. Traditional staircase leads to bedroom one with three single beds fitted wardrobes dressing table en suite bathroom top bath and 140cm walk in shower, washbasin, toilet,bidet and Victorian towel radiator. Bedroom two with double bed, fitted wardrobe, chest drawers own separate bathroom with bath shower mixer toilet and basin. A single bedsette and folding bed in downstairs lounge. Fridge Freezer, Rangemaster cooker, washer, dryer, dishwasher, microwave. Flat screen TV with Freeview and DVD player Free Wi Fi, GCH. Bed linen provided. Spacious enclosed rear garden with patio sun deck and hot tub. Dogs are welcome at a £15 per pet. Parking to the rear. Strictly no smoking. My wife Debra and I both work in the fashion business I as an agent and my wife has a lovely ladies wear boutique called MOMENTS in Huntriss Row Scarborough. There is 10% discount to all cottage customers. Debra and I bought the cottage because of its unique location close to the A64 so that I could get to my showroom in Leeds and Derbra to her business in Scarborough. We soon realised that we were situated in one of the most sought after areas for activity holidays being so close within 30 mins drive of Whitby York Scarborough Helmsley and only five mins to North York’s Moors Railway. The Cottage is situated right in the centre close to all the amenities and when you need to unfocused and chillax a lovely walk along the stream on a sunny day was just perfect. In the golden Triangle of North Yorkshire everything you need is within 5mins local 30mins else wear its just perfect or what someone once said " its a little gem "
Bedroom one has en-suite with roll top bath washbasin, bidet, Victorian radiator and 1400mm walk in shower. Bedroom two has its own separate bathroom with bath, shower mixer, toilet and washbasin. Spacious lounge with traditional open fire with beamed ceiling. Samsung flat screen TV with Freeview DVD player with surround sound. There is watersking at the mere in Scarborough please ask for details if interested as the owners are both members. GANTON 20mins drive MALTON and NORTON 15mins drive SOUTH CLIFF and NORTH CLIFFE Scarborough 30mins drive. Nice relaxing feel to this cottage loved it nice and walking distance to the village in which had all amenities.close to Pickering whitby Dalby forrst . Loved the hot tub what was well servest as their wás someone everyday came to check it.also saw .the Ian who owned the property who was brill. Cottage was lovely especially with the added bonus of the hot tub. Comfortable lounge, nice kitchen, quiet....peace....bliss. Thornton Le Dale is beautiful and proves the Yorkshire folk to be one of the friendliest in the country. Nothing was a bother to anyone we met, from help finding the cottage, to the local pubs, tea rooms and churches. It was lovely to see so many smiling faces. We would most definitely recommend. Thanks William for your kind review, Debra and I do our best to make the cottage as welcoming as possible when you first arrive, and yes the hot tub is big drawer to wind down the day if you've been out trekking the area, which I am sure like everyone else you found so beautiful at this time of the year with the Christmas lights on. It was our pleasure to have you as our guests. Deb and I are so pleased that you had such a lovely time it is the most idyllic cottage and village in Yorkshire. Leeds Bradford Airport 1hr 30mins Manchester 2hrs. Pickering, Dalby Forest, FlamingoLand 5mins, Malton 15mins, Helmsley 20mins Whitby and Scarborough 30mins, York 40mins. In the village of Thornton Le Dale you will find Post office newsagents, Nisa store, coffee shops, fish and chips, pizza takeaway, three pubs and one private restaurant. Nearby Pickering there is Co-op, Post Office, Boots chemist, HSBC and Nat West Bank, Doctors, Bike Hire, Library, Fish and Chips, TV Electrical, Outdoor walking shop, Dentist, Estate Agents, Coffee shops, Pubs. Booking Notes: On initial booking 35% of full booking fee up to 60 days before it. If the booking is within eight weeks full fee required. Payment can be by cheque or internet banking. Short breaks of three nights available on request. Changeover Day: Normal changeover day is Saturday departure before 10.00am and arrival after 2.00pm. Key details given before arrival. Notes on prices: Prices shown are for full weeks short breaks of three nights or more are available on request.